Today’s excellent weather allowed some late-season adjustments. This small hive was in a deep that had been modified to accomodate four 2-frame nucs and was subsequently full of superfluous entrances. I had stuffed the holes with wire screen, but the arrival of wet, cold weather demanded an equipment change. The subsequent shift in entrance placement caused the bees to pile up for a little while on the face of the hive, giving me a great view of the amazing pollen loads coming in today. While I recognized the grey as Meadow Knapweed, the source of the golden pollen has me mystified for the moment. There’s not a great deal blooming outside of knapweed, a little Phacelia I planted as a green manure in a few garden beds this July, and the ever-faithful borage. None of which has yellow pollen. Ah, well. After a day like the one we just had, I guess I can live with a little mystery. The pollen (at least in my neighborhood and backyard in Eugene, OR) is coming from evergreen trees that have been pollinating for the last couple of weeks, which I have never seen them do this late in the year. Since it has been a warm fall thus far, it may explain why I have such a thick layer of pollen dusting everything right now. 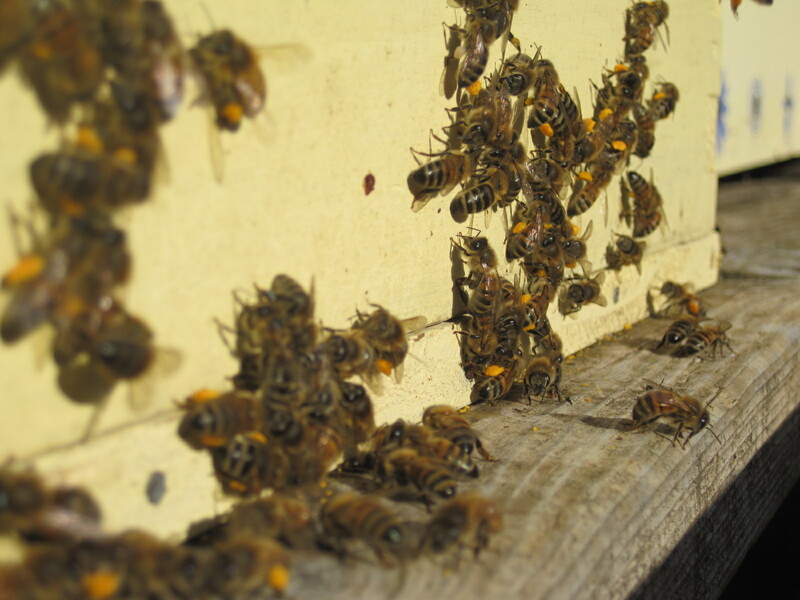 The bees are happy and getting lots of pollen storage for the winter! I am intrigued, Maggie; it would be fun to find out what kind of tree it is. Our bees are still hitting the Goldenrod pretty heavy and coming in with yellow pollen. It has been so warm here on the Mohawk River that we still have blackberries in blossom. Kelly great photo, we are seeing the same here, I did get a sample of that yellow pollen but have not had time to ID yet. I checked in front of the hive early this morning (before the rain cut loose), but they were very economical with it. I’m glad you managed to collect some.